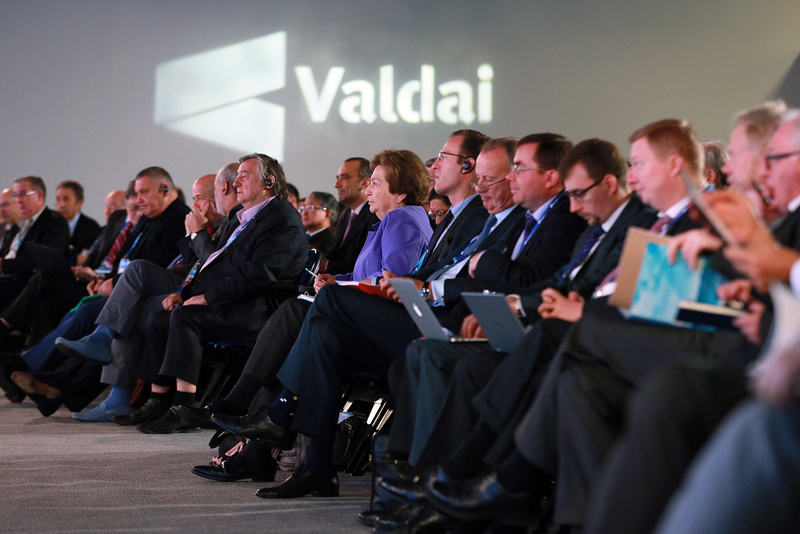 Participants at the opening of the 13th annual meeting of the International Valdai Discussion Club in Sochi. Russia seeks to gain more voice in shaping global political debates amidst increasingly partisan rhetoric on international politics with a newly announced award by the Valdai Discussion Club. Prominent political experts in Russia have announced an international award designed to stimulate research and debates on international politics in a major attempt to attract the attention of the global expert community to Russian expertise in the sphere of international politics. The new annual award was announced by the Valdai International Discussion Club during the opening of the 13th annual meeting of the Valdai Club in Sochi on Oct. 24. The initiative represents one of the most significant attempts by Russian experts to gain recognition among the global political community, which has been largely dominated by English-speaking experts during an increasingly tense period in Russia-U.S. relations. “We want to have another tool for determining trends within our [expert] community,” Andrey Bystritskiy, Chairman of the Board of the Valdai Club, told RBTH. “The award will demonstrate what [Russian] experts consider the most essential developments of international political thought and, to some extent, international political practice,” said Bystritskiy. Russian experts are expected to represent a minor share of the 30 award committee members responsible for the nominee selection process. The organizers' decision to invite prominent foreign experts to join the award committee may be a sign of pluralism, or an attempt to preclude accusations of bias, an anticipated critique in light of the increasingly partisan character of global politics. Seeking an opportunity to demonstrate that strained relations between states do not preclude nominating experts from countries other than Russia, Valdai Club representatives presented three symbolic prizes to experts from the U.S., China, and Russia. Timothy J. Colton, Director of the Davis Center for Russian and Eurasian Studies at Harvard University shares the honor with Chinese expert Sheng Shiliang and Russia’s Sergei Karaganov, Dean at the Higher School of Economics in Moscow. The award is presented to experts for significant contributions to global political debate, which could be in the form of books, papers, lectures or public talks, and will include a monetary prize for each recipient, although the organizers declined to specify the amount. The honors were a symbolic gesture for now, however, with the first award ceremony scheduled for next year.